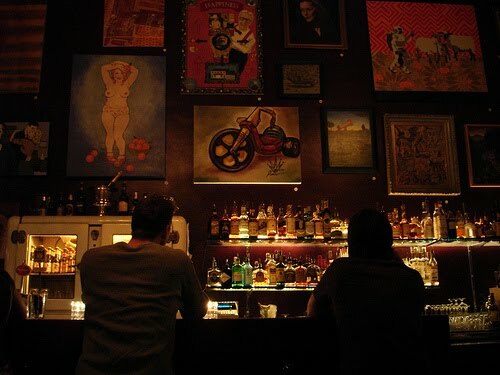 Tonight's cocktail hails from The Hideout in Seattle, a dark and delightful little bar filled with independent art and stocked with well-crafted cocktails. This drink, along with The Bittercup from Pourhouse, is essentially what inspired me to do this whole series. I love the flavour of Fernet - I often drink it at home with some club soda - but when used in cocktails it consistently overpowers the other ingredients and rarely gives a balanced drink. The Toronto was the first one I tried that I felt was balanced when made by a professional, but I failed time after time to achieve that balance at home. I then found The Bittercup, which is an incredibly creative drink, but I felt like there was more to be achieved and in a simpler manner. Then on my last trip to Seattle, I stumbled across The Hideout and tried the Profanity Hill cocktail from bar manager Kristen Naranjo and was first of all impressed by the very different style, but also realized how well Fernet worked with fruit - in this case, blackberry. Add in some sour, a dark rum base, and top with ginger beer (the last being absolutely key) and suddenly a very different and wonderful thing is accomplished with Fernet. Profanity Hill took me on an adventure at home experimenting with different kinds of fruit and different bases and I ended up having a lot of fun and finding a new appreciation for the amaro. I also feel like I've learned a lot more about balancing a cocktail in general. As I've mentioned in previous posts, I feel like the cocktails that make Fernet work the best are ones that treat it as a bitters rather than a liqueur. L'Abattoir uses it as a bitter float, Diamond and Keefer use it in replace of Angostura bitters in Trinidad Sour-style drinks, Boneta uses little more than a dash, and so on, and these drinks all really work. I've been to numerous bars that use a full half ounce in place of a typical liqueur in a basic drink and all you end up with is a big, high-proof glass of Fernet. I'm excited this month to share all these delicious, balanced, and exciting drinks using Fernet from all these wonderful places, and hope that it inspires some of you reading to start experimenting more at home - whether it's with Fernet or not. On to the drink, and if you end up in Seattle any time soon there are a lot of amazing bars to visit, but please put The Hideout on your list - and if you do, make sure you try The Profanity Hill. Shake first three ingredients, strain over ice and add barspoon of preserves on top (bramble style). Top with Goslings Ginger Beer. Photography by The Last Bite.